A single-use shield or covering designed to accept the heat of reentry and burn off. Is it possible to jump out of a supersonic plane traveling at 2,000 miles per hour so high above the Earth that it is in near vacuum? Not as far as the Norheimans were concerned. Phryges, still at an altitude of over thirty thousand feet, kicked away the remaining fragments of his cocoon... Low enough at last, he pulled the ripcord. This is a very early reference in science fiction to the idea of ablative cooling applied to the problem of dissipating heat upon reentry. The idea of having a flexible device that can be used by a single individual appears to be Smith's. "In the case of meteors, which enter the atmosphere with speeds as high as 30 miles per second, the interior of the meteors remains cold, and the erosion is due, to a large extent, to chipping or cracking of the suddenly heated surface. For this reason, if the outer surface of the apparatus were to consist of layers of a very infusible hard substance with layers of a poor heat conductor between, the surface would not be eroded to any considerable extent, especially as the velocity of the apparatus would not be nearly so great as that of the average meteor." Work that began at RAND in 1952 led to the solution of the critical problem of nose-cone overheating during the reentry of a space vehicle into the earth's atmosphere. Along with the use of a blunt nose cone to dissipate heat, RAND's studies suggested the use of ablation cooling.14 The effective use of these methods was not only essential to the space program but also critical to the success of the intercontinental missile. Although various people, including Wernher von Braun and experts at Douglas Aircraft Company's Project RAND, had studied spaceflight during the 1940s, nobody began thinking about how a vehicle would actually return from space until the early 1950s. The few who did, like von Braun, realized that probably the best way to do it was to build a very big vehicle and circulate a fluid through its skin to soak up the heat of reentry... Clearly the problem of reentry to Earth's atmosphere was a significant challenge for the early spaceflight researchers, as they considered how best to overcome the heat generated by friction as a spacecraft slowed in the atmosphere. While most proposals for satellites between 1946 and 1957 avoided the difficult problem of reentry, some researchers tackled the problem with determination. 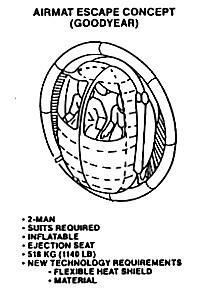 Something similar to this was designed by Goodyear in the seventies- the concept was that this was an inflatable "escape pod" that could be used in emergencies. Space suits were required.